Everyone gains when neighbours come together! The work of the Social Development Centre Waterloo Region has been rooted in the life of neighbourhoods. On one hand, we gain a deeper understanding of the immediate context in which people relate to each other, revealing opportunities for broader community-led planning and development. On the other hand, we enable residents of all ages and abilities to gain an exceptional and rewarding experience by making their community vision come to life. Our teams are able to support them with: neighbourhood profiles, asset mapping, building lateral connections with other organizations and resources, hands-on knowledge transfer and also support in organizing, promotion, and advocacy. Message from Cherry Park: Unleash the Power of Neighbours! on March 24 at St Mark’s Lutheran Church. Cherry Park Neighbourhood Association and Social Development Centre are hosting gathering to explore what drives people’s action in their neighbourhood. They have been working together to create a buzz around a special engagement process thanks to the Neighbourhood Connection Award won at the 2015/2016 Festival of Neighbourhoods Finale. We will supporting the current leaders and volunteers to connect with interested neighbours who want to explore what excites and inspires people to get involved and how to best nurture future engagement. Read more in the Cherry Park Neighbourhood Association Newsletter and in the Report made by the Neighbourhood Connections Working Group. The Neighbourhood Connection Award has been given to the Traynor-Vanier neighbrouhood by the Social Development Centre Waterloo region for the first time at the 2013 Festival of Neighbourhoods Finale Celebration and again in 2914 for the second year in a row to ensure the sustainability of the initiative. Since October 2015, our staff, volunteers and students are supporting this neighbourhood through our Decent Lives initiative. In 2016, the KW Tenant Group has received a Community Development Infrastructrue Grant from the City of Kitchener and is working toward greater autonomy and stronger relationships with the new management, enforcement agencies and tenant support organizations. Thanks to our Festival of Neighbourhoods 2013 Outreach Team, we have developed a relationship with an amazing group of residents in Traynor-Vanier who were determined to make their area a great place to live and raise children. The neighbourhood gradually found itself facing many challenges, such as, frequent changes of management companies, Light Rail Transit construction and removal of the Traynor Park and the Community Trail. The neighbours slowly but steadily build actions and connections to counter the high turnover in the neighbourhood and disruptions of day to day activities. KW Tenant Group has been active since January 2015 to bring the tenants together, bring in the municipal and community supports and bring their area to life. Our team has helped bring the Partnership Table together, including the management company and the City of Kitchener services such as By-Law and Fire Safety Department, as well as Waterloo Region Community Legal Services, R.E.N.T. 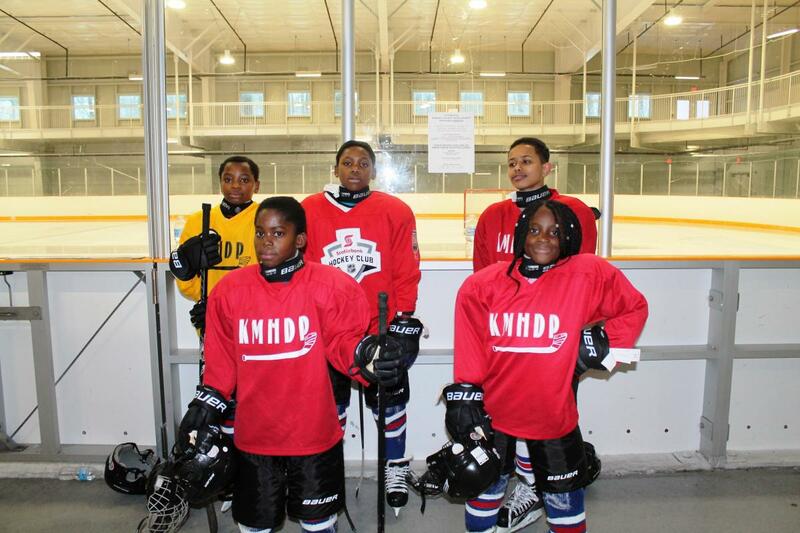 (Renters Educating and Networking Together); mobilized volunteers for programs such as the Summer Soccer Club (June-August 2014) and Hockey Try-outs (Fall-2015 - ongoing); and has brought in ConnectKW staff and technology coaches to support the tenants' efforts (Winter 2015 - ongoing). We are looking to strengthen ongoing collaboration with the House of Friendship programs for families, Community Justice Initiatives and Green Light Arts. Above all, we are porud that the 2017 Spring Activities in the neighbourhood are done by the tenants themselves! Nepalese community is hosting activities such as after school and Bible study. Karate and Music lessons are done by two tenants who master their skills and share them with the rest of us! As more tenants gather to socialize and work together, with the representatives from all four Traynor-Vanier buildings, we hope to see the KW Tenant Group grow into an autonomous tenant association. Tenants Rights Enforcement Information Sheet was created under the leadership of the KW Tenant Group and the Social Development Centre Waterloo Region. It is a system navigation resource that has been validated by the City of Kitchener By-law, Region of Waterloo Fire Safety and Police Services, as well as, R.E.N.T. and the Waterloo Region Community Legal Services. KW Tenant Group continues to work together with the property management team on site to ensure reliable and clear maintenance work process, conssitent communication and safety in the buildings. The LRT process should not divide a neighbourhood in the way that is planned in the Traynor-Vanier area of Kitchener. That is why we have worked with the tenants in the area since 2014 to make sure that their access to food, transportation and workplaces remains an integral part of the planning around the LRT and rapid transit stations. As more money is coming from the Federal Government to improve connectivity in the region, TriTag advocates agree that there is still time to resolve access issues to food, work and transit in the area. Social Development Centre strongly suggested that the neighbourhood should have been fully included in direct and meaningful ways in what was being planned for the final route section along the Hydro Corridor. One group of residents has sent a letter to the Regional Council and opened an online petition to ask for a pedestrian crossing on the 1km stretch. As a result, the City of Kitchener staff has consulted the KW Tenant Group and Social Development Centre regarding the two important projects in the neighbourhood. LRT pedestrian crossing, with consultation kicking off on January 28 and the construction of the new Traynor Park to come in 2017. You can find out more information about the LRT pedestrian crossing in the recent Record (October 17) and CBC KW (October 18 2016 and January 27 2017) articles. "It can take me 2 hours to get to FoodBasics and back with my walker because I take two busses. The bus transfer does not even last long enough." "With two little kids for whom 30 minutes is too much to walk and going by bus around is too long for basic groceries." "It is important to get to work early in the morning when not even buses go." While the City of Kitchener is collecting input for a feasibility study regarding a pedestrian connection over ION tracks in Traynor-Vanier neighbourhood, our team made door to door visits and talked to 176 tenants to contribute valuable input about travel patterns in the area. 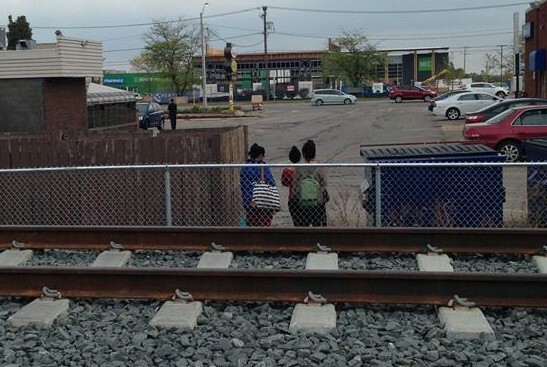 October 2017, the residents in Traynor-Vanier woke up seeing the Fairway side of the tracks completely fenced off. The fence opening on the Traynor side will be closed as well as the LRT testing starts in November. After the consultation in January, the residents did not receive any follow up information about the joint city-region plan to install a pedestrian crossing. The trains will start running next Spring but the funds and the project for the crossing is still not in place. You can read the Record articles posted on the KW Tenant Group Facebook Page and see the recording of the Council presentation and discussion during the Regional Council meeting on October 11, 2017. As this paragraph is added, we are in April 2019, almost a year after the Rally of July 2018 in the midst of the municipal pre-election campaigns, and still waiting for concrete work being done at the crossing. The train testing has been on for over 6 months and people's lives put at risk every day. Read more from a community advocate James Howe about the too long a wait of the residents in Traynor-Vanier. Traynor Park was a close by playground for the families along Traynor, Vanier, Siebert and Woodhaven Road until December 2013 when the construction started to support installation of the ION tracks. Since then, KW Tenant Group and the Social Development Centre have been asking the City of Kitchener to find another suitable location for the park once the construction is over. 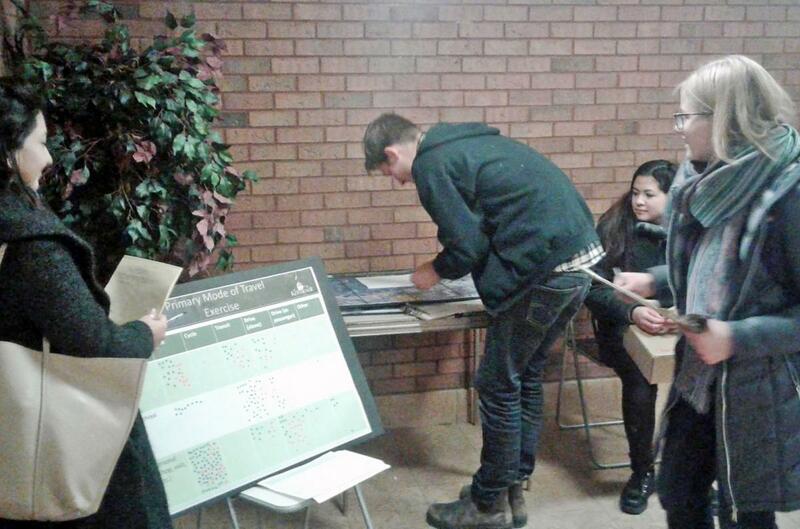 With the support of the Ward Councillor John Gazzola and the City of Kitchener staff, Traynor Park consultation started on April 24th at a nearby St Phillip's Lutheran Church. Thanks to the Social Development Centre Waterloo Region and the active tenant group, the residents and the property management in Traynor-Vanier buildings had other opportunities to share their feedback on the location chosen for the project and their input on what activities should be sustained in the neighbourhood with the new park space. The tenants celebrated the beginning of the construction project at the Annual BBQ on September 13th and are looking forward to successful completion of other projects in their neighbourhood, such as the Pedestrian Crossing Traynor to Fairway and return of the Community Trail. The project will fit nicely with the future community trail to be reintroduced along the ION tracks as well as the potential pedestrian crossing over the tracks. Would you like to see your neighbourhood or community vision come to life? Let's come together, share what we know, and create neighbourhoods that future generations can thrive in! Contact Aleksandra Petrovic at 519-579-3800/ *3009 or aleksandra@waterlooregion.org.